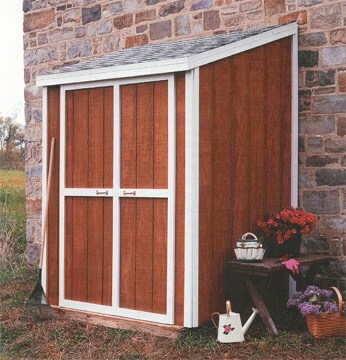 Lean-to shed provides simple shelter for yard gear and more. Photo: Sunset Publishing Corp.
Have you been longing for a shed where you can store lawn and garden equipment, sports equipment, compact outdoor furniture, and miscellaneous tools and supplies? When inconspicuous, functional storage is all you’re looking for, the lean-to is the perfect solution. Per its name, the structure simply leans against the house or garage for additional support and provides a water-safe haven for shielding gear from the elements. If you have moderate do-it-yourself skills and tools, this is a weekend project. Because the shed is designed to abut to another structure, the foundation need only be pressure-treated skids, the roof pitched in only one direction to shed water, and the back wall sheathed with 1/2-inch CDX plywood, which withstands indirect exposure to moisture. See Anatomy of an Outdoor Shed or Playhouse for more about typical shed construction. It isn’t a requirement that this shed be built against a wall—but the structure is designed to take advantage of the wall for strength. So if you modify it to be a freestanding shed, you’ll need to build a conventional stud wall across the back and face it with the same type of plywood siding used on the rest of the shed. For information on how to mark, cut, and fasten wall studs, see How to Frame an Interior Wall (ignore the part about working with drywall because you’ll be using exterior-rated T1-11 siding instead). 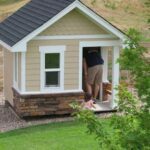 For a freestanding shed, you can build the shed on top of a concrete slab (see Pouring a Concrete Slab) instead of the pressure-treated skids and floor joists; this will actually result in a sturdier—more permanent— structure. Otherwise, for a freestanding shed, the foundation should be constructed on concrete piers or poured footings (see Pouring Concrete Footings & Piers). Be aware that building on footings will raise the height of the shed up from the ground. • 2x4s For studs, header, rafters, top plate nailers, etc. 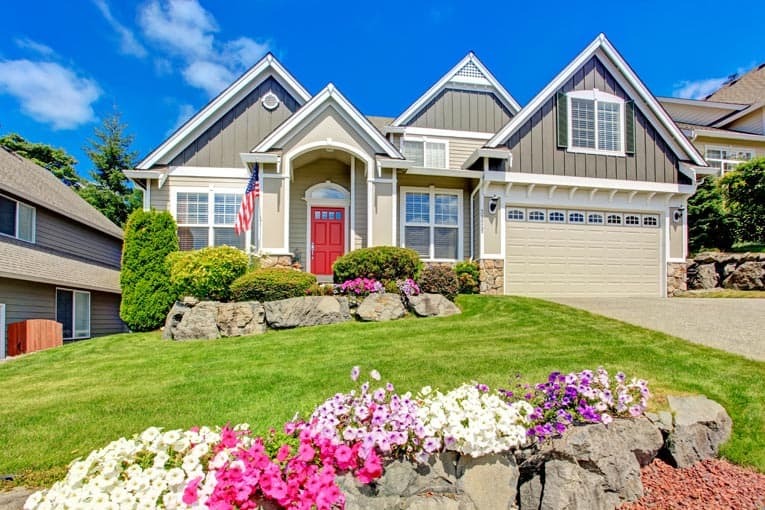 • Asphalt shingle roofing, 15-pound felt, metal framing brackets, door hinges and latch, miscellaneous galvanized nails and outdoor screws, and paint, stain, or preservative. The shed shown here is 6 feet long by 4 feet wide. You can easily expand its dimensions in increments of 2 or 4 feet. 1 To construct the framing for the shed’s floor, cut two pressure-treated 2 by 4s to a length of 6 feet for the rim joists. Then position six 45-inch-long floor joists between the rim joists 16 inches on center (with the exception of the last one, as shown in the floor joist detail at right). Attach them with 16d nails. Cut two pressure-treated 4 by 4s to a length of 6 feet for the skids. Position the frame on the skids, and, when square, toenail the floor joists to the skids. Attach 3/4-inch tongue-and-groove plywood flooring onto the frame. 2 The walls for the shed are constructed separately and then raised onto the frame. Start with the back wall, which is 8 feet high with 6-foot-long top and bottom plates and four studs placed 18 inches on center. The tops of the wall studs are mitered at 18 degrees. Attach the wall to the floor frame and temporarily brace it. The front wall has a 6-foot-long top plate and two 1-foot-long bottom plates, leaving space for a 4-foot-wide door. The four wall studs are 81 1/4 inches long; install them as shown in the front framing detail at left. Next, install the 73-inch-long jack studs, and then attach the 51-inch-long doubled header. Finally, attach the 6 1/4-inch-long cripple studs. Raise the front wall, attach it to the floor, and temporarily brace it. The side walls have top and bottom plates 41 inches long and studs 81 1/4 inches tall. Raise them, attach them to the floor, and temporarily brace them if needed. When all wall sections are square, attach them at the corners with screws. 3 The frame of the roof consists of four 2-by-4 rafters cut so that they rest on the front- and rear-wall top plates, as shown in the rafter detail at right. Install a gable stud directly over the center studs on both side walls to fit between the end rafter and the top plate. Install the sub-fascia and then the fascia to the front ends of the rafters. 4 Position pieces of T1-11 siding on the front and sides of the shed so that they are flush with the bottom of the rim joists. Attach the siding with 8d galvanized nails spaced every 8 inches. Cover the rear wall with 1/2-inch CDX plywood from the bottom of the rim joists to the tops of the rafter ends. 5 Sheath the rafters with 1/2-inch CDX plywood; stagger the joints so that none end up on a rafter. Nail them in place with 6d nails. Attach rake trim to cover the exposed edges of the roof sheathing, and install drip edging. Roll out 15-pound roofing felt, and apply the shingles (see Asphalt Roof Installation). 6 Construct the doors from T1-11 siding, and trim them out with 1 by 3s. Add cross trim in the centers of both doors, and install the door latches. Use strap hinges to attach the doors.